Teacher shortages and extended absences can be very frustrating for any class. This holds especially true for foreign language classes, where it can be next to impossible to find proficient substitutes. The year I started taking Spanish II, our Spanish teacher was out on extended leave following surgery. I still remember the weeks of worksheets that we struggled to complete without the benefit of any instruction. Not only did it seem like mindless busy-work, but we practiced the wrong way to do a great part of it. Talk about counter-productive! When our teacher finally returned, she had to double back and help us to “unlearn” bad grammar that had already fossilized. I can only imagine the discouragement this must have caused for our sweet, dedicated teacher who was also striving to regain her health. If only there had been a way to spare all of us from all that pointless drill in the first place. Would you like to offer your students quality Spanish instruction during their teacher’s absence? Would you like to engage them with meaningful lessons that build proficiency, motivate, and enhance their learning experience? What I have to offer you is the result of over twenty years of teaching experience, research, and curriculum development and implementation. 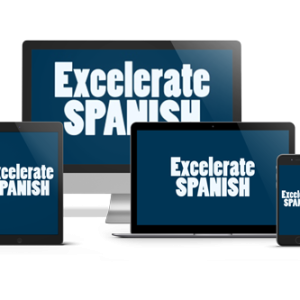 Excelerate SPANISH uses an approach that works for all age groups, because it honors basic principles of brain function and language acquisition. It is relevant, interactive, effective, and kind. Best of all, it is accessible: inexpensive, easy to use, and practically foolproof! If your substitute teacher can operate a DVD player, you’ll have Spanish instruction for an entire class, immediately! Check out multiple products in my store, or buy the entire curriculum for only $139.00. You and your students will love my books and DVDs! If you need multiple copies, check out our bulk ordering options! You may also contact me, and I will work with you on price. You won’t find better resources for less. Please contact me right away so that I can help to meet your needs. I’m here to provide that interim instruction via DVD, to give you ongoing support, and to offer free training to foreign language professionals! 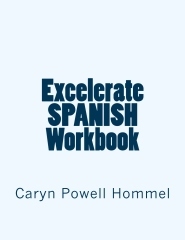 Let’s get started with Excelerate SPANISH!